This Panasonic Toughbook CF-31 review explores the functionality, usefulness and durability of the unit for mobile workers, especially those who might use the laptop in harsh environmental conditions. The results indicate the CF-31 Rugged Laptops that can withstand the rigors that lie beyond the safety of your office walls. The CF-31 is designed to accommodate industry needs. 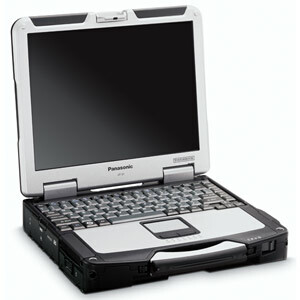 This Panasonic Toughbook CF-31 review found it is a good option for workers across a variety of vertical industries. The unit comes equipped with the 32-bit version of Windows Professional 7. It is mobile and GPS ready, with optional 3G Gobi or 4G LTE mobile broadband.The Panasonic CF 31 Toughbook, powered by a dual-core i5-540M with 4GB of RAM, is not the fastest unit, but it is suitable for most field applications. It easily accommodates vertical-market software for construction, public service and sales applications, as well as customized, in-house solutions. This Panasonic Toughbook CF-31 review determined this rugged contender offers mobile workers functionality without having to worry about being dainty. Field workers can take the unit into the most inhospitable of places without the constant fear of breakage or inoperability. The tests show the unit can withstand drops from 6 feet when it is turned off, and drops from 3 feet when the unit is running. Working in the elements is no problem for this tough machine. The Panasonic Toughbook 31, with its magnesium alloy case, is built according to IP65 certification for weatherproofing, and MIL-STD-810G certification for shock, vibration, and temperature extremes. It easily endures pressure of up to 300 pounds on a closed lid, and rainfall of 6 inches per hour. Working in direct sunlight would be impossible with some computer units, but not the CF-31. The rugged laptop features a sunlight-viewable touchscreen that is readable even in the harshest of glares. The CF-31 puts in a full day’s work, with a battery life of 9 to 14 hours, depending on the CPU. The Toughbook features a dashboard mounting solution;a DVD Super Multi drive; PC card type II x 1, SD card (SDXC) and ExpressCard/54 x 1 expansion slots; a removable 320GB hard drive; 4 2.0 USB, a VGA, HDMI, and Ethernet ports; and headphone and microphone jacks. This Panasonic Rugged Laptop CF-31 review found that communicating with the office is no problem thanks to the integrated webcam option. It is not all good news; this Panasonic Rugged Laptop CF-31 review did reveal a few minor drawbacks. The CF-31 is thicker than some rugged solutions, and has a hefty weight of 8.8 pounds. The heavy weight is minimized somewhat by the pullout carrying handle on the top of the unit. While the 13.1-inch panel is superb for working outdoors, inside the screen appears washed out. Workers who use the unit both indoors and outdoors can offset this drawback by using keyboard shortcuts to adjust the screen brightness settings. Another minor drawback is the weird location of the delete key, which is located at the bottom near the cursor arrows. Overall, this Panasonic Toughbook CF-31 Review found this computer provides durability and reliability while increasing productivity for workers on the go. The CF-31 is sturdy, easy to use and has the integrated features most valuable to those who travel between the field and office. The CF-31 comes with a 3-year limited warranty for parts and labor.